Although most people are probably unaware of it, buying and selling meteorites is big business, very big business. The rules of the market place apply to space rocks, just as they do for any commodity that’s in short supply. And how much is this trade worth? Well, no one really knows for sure, but you can get an idea by looking at the prices being charged. Meteorites from Mars or the Moon generally fetch the highest prices. A spectacular example is the unique Martian sample NWA 7034, the famous “Black Beauty”. It is retailing at between $10,000 and $20,000 a gram. Even at the lower end of the scale that values the fist-sized, 320g stone at a cool 3.2 million dollars! For the more common lunar and Martian rock types the prices are lower, but the results can still be spectacular. The Meteoritical Bulletin Database currently lists 203 meteorites from the Moon; all are finds from hot or cold desert regions. Prices for lunars start at about $500 a gram. The feldspathic lunar breccias NWA 5000 is currently advertised with one dealer at $896 a gram, which values the 11.5 kg meteorite at a whopping 10.3 million dollars! So where does this trade take place? 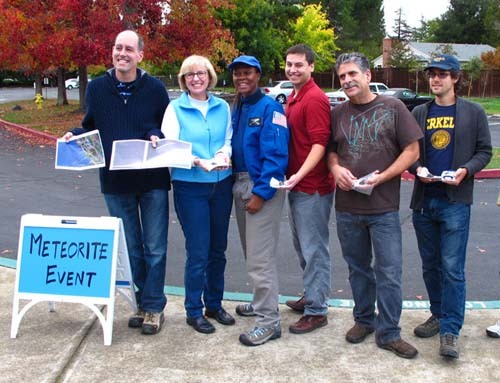 Well, believe it or not, many meteorite dealers ply their wares on good old eBay. There is plenty of material on sale and generally something to suit all tastes and budgets. 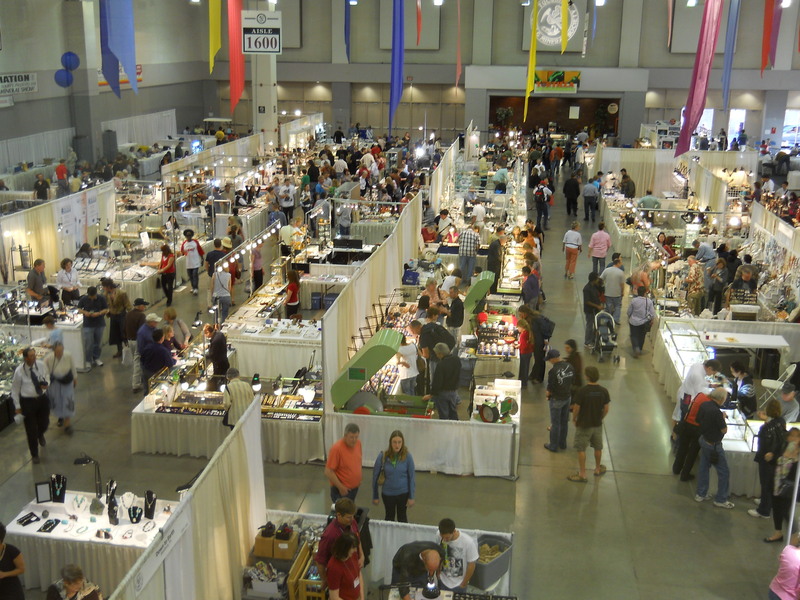 The annual Gem and Mineral Show, taking place this year between January 29th and February 15th, is undoubtedly the world’s most important venue for trading extraterrestrial rocks. By all accounts it’s a pretty amazing event, with dealers and collectors coming from all over the world. The range and quality of the material on show also attracts interest from major interational museums. Graham Ensor of the British and Irish Meteorite Society (BIMS) recently sent me the link to a really interesting article in Discovery magazine by Jonathon Keats. The article discusses the development and current state of the commercial trade in meteorites. The role of the Tucson mineral show is also discussed. The two dealers featured in the article, Ruben Garcia and Robert Cucchiara, have in fact provided samples for the Open University in recent years. Ruben Garcia generously donated material to Everett Gibson and Colin Pillinger for our study of the Holbrook meteorite and Robert Cucchiara supplied fragments and slices of the Campo del Cielo iron meteorite for outreach purposes. In both cases the relationship was positive and professional. The main thrust of the Discovery magazine article is that the relationship between planetary scientists and dealers is on the whole positive, and that a healthy commercial trade in meteorites results in the discovery of new and scientifically important samples. Based on my own experience, I would endorse this conclusion. Sure the dealers are making money out of the trade, there’s no doubt about that! But as the article points out, science benefits by the discovery of unique, scientifically important specimens. Again, NWA 7034 is a good example, as we discussed in a previous post. However, it is also important to put this trade into context. The meteorites being bought and sold in Tucson are from non-Antarctic regions, most importantly the deserts of North Africa. 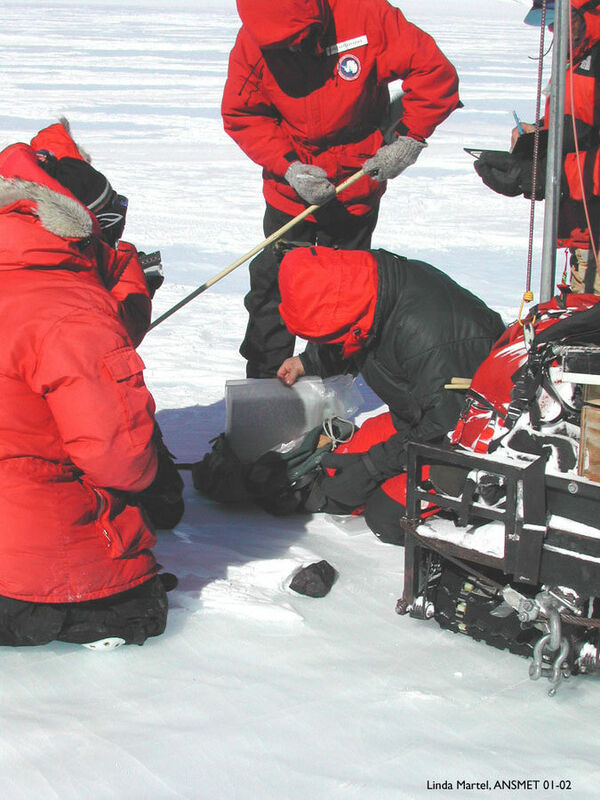 As important as these samples undoubtedly are, they are still less significant in terms of numbers than those collected in Antarctica by organised scientific expeditions, such as the US ANSMET team or the Japanese National Institute for Polar Research (NIPR). A few figures from the Meteoritical Bulletin Database will help to illustrate this. Out of just over 50,000 officially classified meteorite specimens listed on the database, nearly 34,000, that’s 67%, are from Antarctica. These samples are not available for trade, but are exclusively for scientific study. So while the increasing numbers of samples from Northwest Africa and other hot desert regions are of major importance, they remain subordinate to the material that is collected each year from the vast frozen treasure house that is Antarctica. And if the current levels of activity in the frozen south are maintained, this is not going to change anytime soon. But looking at the specimen numbers in isolation can be misleading. Back to those lunar and Martian samples again. Of the 205 officially recognised lunar samples on the Meteoritical Bulletin Database, 171 specimens, that’s over 80% of the world’s collection, are non-Antarctic finds. And it’s the same for Martian meteorites, with 116 out of a total of 143 (81%) being non-Antarctic finds. One problem could be pairing. That’s where, for a variety of reasons, specimens from the same fall are given distinct names. However, while this problem cannot be completely eliminated, possible pairings are estimated in the list of lunar samples produced by Randy Korotev of Washington University. This compilation suggests that we currently have samples from a total of 109 distinct lunar meteorites, of which 87, just under 80%, represent non-Antarctic finds. So hot deserts really do seem to be providing us with a disproportionate number of scientifically important samples. This is probably the result of a complex set of circumstances, most notably the very different climatic conditions involved. The large numbers of rare and scientifically valuable meteorites that are coming out of “hot” desert collection areas are a testament to the skills and expertise of those involved. In my experience “dealers” are really just enthusiasts. Like scientists, they share a common fascination with these incredible rocks from space. Most dealers are in it because it’s their passion and there’s nothing wrong with that. February 11, 2015 in Meteorites. Thank you for an enlightening blog. I just wanted to let folks know it is entirely possible to get specimens of Antarctic meteorites into private collections. They are not exclusively for research institutions. I have three small but appreciable Antarctic specimens in my collection, which were purchased from dealers who had acquired them in trade from research institutions. They are very hard to come by though, and generally carry a higher price tag, often on the same level as historic specimens. Many thanks for your comments. I was unaware of the fact that Antarctic meteorites are traded so thanks for this clarification. However, as you point out, this material is very rare in private collections and in general Antarctic finds are held by scientific institutions for research purposes. Well this is very interesting. The meteorites that fetch the most cash do not have to contain crazy new compounds. In fact they are often quite ordinary looking rocks. But what is important is that they come from crazy places, like the Moon or Mars. Mars rocks are an interesting case. We have visited Mars and know a lot about it and yet we have never brought back a sample from the “Red Planet”. And yet thanks to meteorites you can hold a piece of Mars in your hand. That’s why people are willing to pay big money for these samples. Many thanks for your comment.